What do two nice Jewish girls do when they want to start a family? They can marry two nice Jewish boys. Or, if they happen to be lesbians, they can buy sperm online from California! 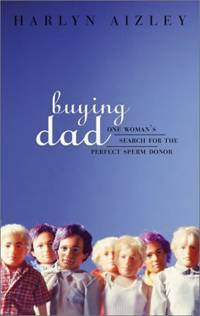 Buying Dad (Alyson Publications, July 2003) is a hilarious, edgy, first-person chronicle of a year in the life of a woman engaged in a very alternative family-planning experience. Peeling back the layers of self-indulgence accumulated in thirty-odd years as a self-proclaimed gay, childless, albeit happy neurotic, Aizley takes the reader on one of the most personal, intimate, and utterly female journeys any woman, gay or straight, can make - that of becoming a mother. Aizley's story begins with the search for sperm - Known or unknown donor? Delivered on dry ice or in a nitrogen tank? The journey unfolds within the context of her relationship with her female partner, her mother's diagnosis of cancer, the threat of her own possible infertility, and finally pregnancy itself. Aizley's wry voice and candid prose embrace this confluence of major life events with the humor and wisdom that make Buying Dad accessible not only to other lesbians, but to any woman who ever has considered ending a lifetime of sleep-filled nights and becoming a parent.